Reaching to the heavens is a work of installation art which is not only a feast for the eyes, but for the ears as well. 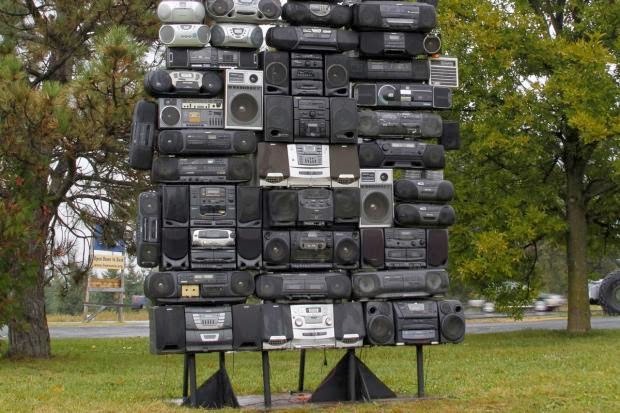 “Got the Power” is a display of over 100 boomboxes arranged into a tower, with the accompanying sounds emanating from about a dozen radios within the structure playing songs and oral histories which are relevant to life in Brooklyn. Created by Bayeté Ross Smith, an artist from Harlem, “Got the Power” is only the most recent of his creations. His first boombox piece was installed in Harlem. Later he erected similar sculptures in Minnesota, Alabama, and elsewhere. The radios play music which the locals have chosen. Ross Smith requests from the residents where his tower will reside for their favorite songs and stories, creating a soundtrack that is site-specific. "The exhibit references the role boomboxes have played in urban communities and within popular culture, the resulting sculpture and soundscape is a symbol of pride, power, and autonomy," said Ross Smith. The tower will be on display from February 19 to April 27, 2014. Ross Smith is still in search of donated boomboxes, oral stories and songs about Brooklyn for his latest effort.